Living as we are, in temporary digs, with much less than 1/2 of our "stuff," household chores take very little time. My husband has no shop in which to putter, my hobbies, other than my sewing machine are packed in boxes, and life is very simple. So we take a lot of walks, good on several levels. Exercise is one benefit and we're walking off the Christmas cookies and chocolates we've indulged in. Another benefit is spending time together. We walk, we talk, we enjoy each other's company. A third benefit is that of reacquainting ourselves with this town we've grown to love. We're enjoying this month of quiet before we can move back upstairs into our home and the settling in will begin in earnest. Although the days have been gray and often dismally wet, a hint of lightness in the sky this afternoon had Tim suggesting a walk along the breakwater. Here is where cruise ships dock, sea planes land, and other sea craft enter the protected harbour. The breakwater points a long finger out into the strait. Across the water we can see the Olympic Mountains of our US neighbours. 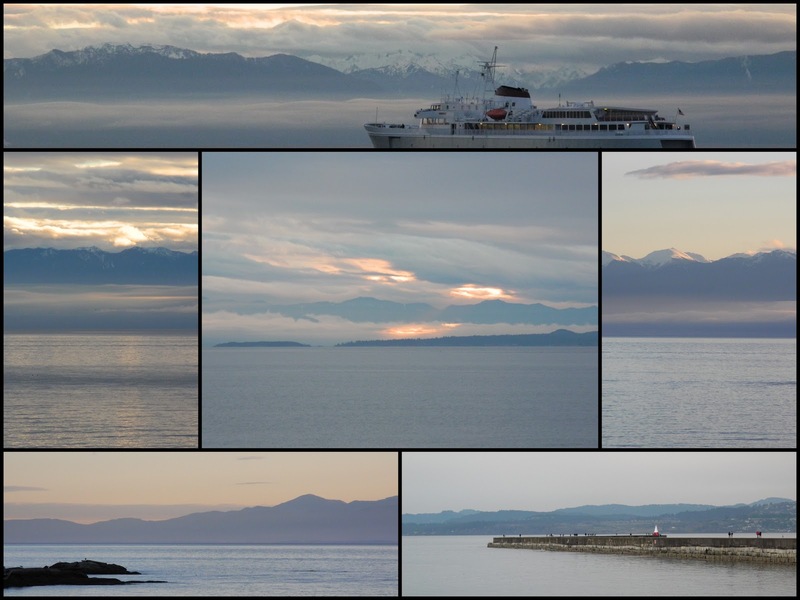 The ferry boat in the top photo is the Coho, plying the waters between Victoria and Port Angeles. Linking once again to Mosaic Monday, hosted by Mary at the Little Red House. No place does 'blue' better than the Island! I loved being taken on your walk, as I missed mine today. Beautiful, serene mosaic! Now I have to go check out that amazing looking onion soup!!! You live in a beautiful area, and the water is very calming. We walked today also but it was through the woods. Thank you for sharing your walk! These scenes look very familiar! Lovely mosaic Lorrie! I love these beautiful images!!! Enjoy your time together!!! Love your photos!! The one with the ship is great!! Happy "getting settled" have a great week! Oh my goodnesss ! What a gorgeous collage !!! Breathtaking ! So pretty, what gorgeous views! Beautiful place you live, the water looks so tranquil. Thanks for sharing your walk. I had been walking almost daily until Christmas, and then, I've been finding so many reasons I am too busy. You are reminding that taking a walk is a restful gift you give to yourself, and not another thing on the to-do list. So beautiful, Lorrie . . . simpler days are so refreshing are they not? Nothing like a walk with your best friend (hubby) in a place you love. I've missed something, probably due to being away for nearly 3 weeks. I hadnt realised that you had to have another move. Is it for more renovations? What a wonderful mosaic, love all the shades of blue. Many years ago whilst RV'ing in the States we went as foot passengers on the ferry from Port Angeles to Victoria. I wonder if we were on the Coho? Hello, looks like a lvoely place for a walk. The views are beautiful. Gorgeous photos and mosaic. Have a great week! It's so wonderful that you get to spend so much time together and taking all those beautiful walks can only rid you of stress. Your photos are magnificent today! There's nothing like the calming effect of blue...and I love the hint of light showing through the clouds. Hope you get settled soon...but don't stop taking those awesome walks. I love seeing your photos. The breakwater has been a favorite destination for my family for years. I rounded the breakwater so many times going back and forth from Victoria to Seattle when I worked on the Princess Marguerite. I'm looking forward to seeing all the places you and Tim wander to this month. What a wonderful place to walk by, so calm and peaceful! Thank you so much for the quiet inspiration! It sounds almost like you are on a vacation! Love your island blues. To me, your photographs of the sky and water speak of serenity. Thanks Lorrie - I wonder what happened to my link. i must have done something wrong. I did type it in rather than copy and paste. Hope the sun shines for you soon! Really beautiful blues and mosaic. Wonderful sights. Lovely photos -- don't we live in a magical part of the world!? May I ask what program you use to assemble your mosaics? Lovely mosaic and in beautiful light blue color. Thanks for visiting as I enjoy strolling down your page to the bottom! Glad you are getting to enjoy some qualtiy time together! That is just so incredibly jaw-droppingly gorgeous scenery. Lucky you!! And 'putter' is a fab word - I wish we said it more in the UK. I should be the putter ambassador!! This is beautiful. A bit quiet for my state of mind right now, but still so beautiful! Great collage. I guess with days like that you are like here right now and needing the lights on all day.